Costume Hire for every event in and around Wellington… Decided on a theme yet? Want to make your school ball stand out from the rest, bring your theme to life…? Why not hire costumes… Imagine a theme of Ancient times, teachers dressed as roman soldiers… Or willy wonkas chocolate factory with waiters, junior helpers etc dressed as oompa loompas. 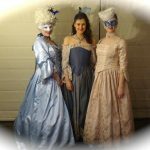 We’re sure you’ll find it all here from medieval knights to rock stars, magic wands to plastic swords… School ball.co.nz is only too happy to recommend the following Wellington costume hire businesses.